Processor power consumption has been spiraling through the roof, both team blue (Intel) and team green (AMD ) have made attempts to address this issue. The first option was to throttle back the speed of the processor when running with low utilization. This makes a lot of sense when you think about it, why do you need a CPU running at full speed and sucking up a lot of energy when the machine sitting idle. Moving to a smaller CPU die manufacturing process usually helps but if you're trying to save an architecture that has a fatal flaw (like the Pentium 4), this is more of a band aid move. Intel eventually scrapped the Netburst architecture in favor of the Banias (Pentium M) later revised to be the Core 2 Duo. AMD on the other hand, has stuck with its K8 architecture because it doesn't suffer from the same degree of energy and heat problems. AMD hasn't moved as quickly to new manufacturing processes sticking with 90 nanometer for quite a while. Today the money is with 65nm SOI processor manufacturing, and with the AMD Athlon64 X2 4800+ the company has finally done the die shrink. At the moment Intel might have the performance lead with the Core 2 Duo, however AMD's overall processor lineup is still more attractive to mainstream users, because well... there aren't many cheap Intel Core 2 Duo yet. What's nice about AMD's dual core K8 CPU lineup is that you can find a dual core processor quite easily, no matter what your budget is. Starting from the mainstream Athlon64 X2 3600+ to the high end X2 6000+, there is a dual core Athlon64 X2 processor for you no matter how much you can spend. The Socket AM2 AMD Athlon64 X2 4800+ processor offers us a decent mix of performance and value, with a retail price of $253 CDN ($215 US, £112GBP) it certainly won't break the bank either. The Athlon64 X2 4800+ is built on AMD's 65 nanometer manufacturing process, and this means it will help to address the power and heat issue that PCSTATS has been commenting on for the last six months. We do like it when processors become more powerful and more energy efficient, after all. Aside from the die shrink from 90nm to 65nm, the K8 architecture is identical to that of the Athlon64 X2 5000+ processor PCSTATS examined previously. 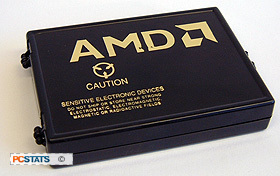 The Socket AM2 AMD Athlon64 X2 4800+ processor comes clocked at a cool 2.5 GHz, with a 12.5x CPU clock multiplier (12.5 x 200 MHz = 2500 MHz). Each core in this dual core Athlon64 X2 4800+ CPU has a 128KB L1 cache along with a 512KB L2 cache. This is a bit different from what AMD did with its Socket 939 series Athlon64 X2 4800+, it ran at 2.4 GHz and had 1MB L2 cache per core. AMD's Athlon64 X2 4800+ processor is compatible with all Socket AM2 motherboards on the market although a BIOS flash might be necessary for the board to recognize the processor properly. The bus and HyperTransport is the same but some newer model numbers are not always recognized by older motherboards. The integrated memory controller supports up to 8GB of DDR2-800 memory running in a dual channel configuration. Like all available AMD processors based on the K8 core, the Socket AM2 Athlon64 X2 4800+ is x86-64 compatible. It can natively run both 32 bit and 64 bit applications like Microsoft WindowsXP x64 Edition, or the 32 and 64 bit versions of Microsoft Windows Vista. The 940-pin Athlon64 X2 4800+ that PCSTATS will be testing is based on the "AAAFG" stepping (K8 'Brisbane' core) and was built in week 44 of 2006. There are plenty of Socket AM2 motherboards on the market, but for the best results based on the following chipsets; nVIDIA's nForce 590 SLI, GeForce 6150 and the nForce 570 Ultra. PCSTATS has reviewed many AM2 motherboards right here. We shouldn't overlook VIA's K8T890 either.